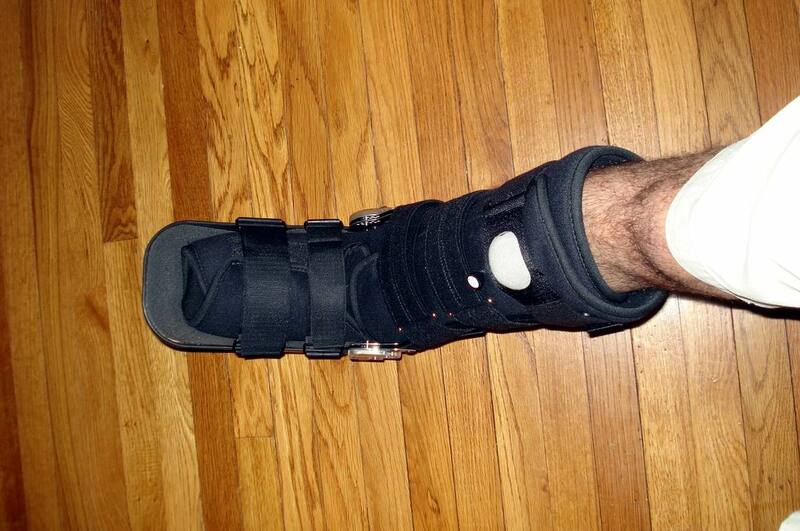 » Goodbye cast, hello boot All this for a foul ball? All this for a foul ball? As the song goes, “I’m walking, yes indeed I’m…partial weight bearing?” Forgive the lengthy post, but hey, I’ve got time on my hands. At day 15 post-op my cast came off and the 15 staples were plucked out (not painful, photos below). The scar looks okay, though I’ve noticed a little bulge near the top. I guess I’m glad my surgeon went in “off center” after reading of people’s complaints that the incision on the back of their heel gets irritated by the boot. I was then outfitted with the must-have fashion item sweeping the runways: a black DJ Ortho boot. I waited a few days before posting so I could report on the transition. First, let me outline my doctor’s timetable. His plan is for me to use the boot for 4 weeks and then start PT. I don’t have any heel lifts, but my doc did tell me to get one made for when I go into two shoes. As for instructions…Dr. Very Laidback said I did not have to wear the boot while sleeping. That’s a relief because, as others have stated, the sucker is hot. Especially during these dog days of summer. It’s also heavy. I bought some of those Under Armour moisture wicking socks which have yielded mixed results. I suppose covering the sock in a tight boot defeats the design that lets it breathe. Next issue was mobility. He said I could go from two crutches to one, to a cane if I needed it, then nothing. “So, um, doctor, what does putting some weight on it mean? Like how much, and when should I start?” “Just do whatever you can,” was his sage advice. So how has it been? So far, so good. By day two I was rolling the foot heel to toe, making crutching much easier because I’m no longer supporting my whole body. By day three I was down to one crutch for most of the day. I’ve even tried ditching them both, though I’m not really there yet. And kkdub, I slept the very first night without the boot with no problem at all. I’m in the same boat as those who describe the injury as not being all that painful. Yes, the incision is a little tender, and the tendon feels tight and stiff, but moving the foot does not cause excruciating pain that would make me stop. I have noticed swelling, for which ice and elevation provides immediate relief. You seem to be progressing very well. Good for you! I still sleep in my boot, but living in Houston the a/c is on all the time right now anyway, so temperature isn’t a problem and I’ve got the sleeping positions down. Keep us posted on your progress. You seem to be on a fast track so I’m curious what all he has in store for your PT when you start. I get a kick out of the chance to stay nearby individuals who can’t help contradicting me. It’s an incredible approach to ensure you are thinking effectively. Continuously address your firmly held convictions. It was super cool post and I have never been seen never in my life. In that sort of articles for the most part are fundamental by everybody. Awesome shared, thank you so much. Thank you for this awesome article. It’s a detailed information. Thank you for sharing this detailed article. It’s best article I have ever read on this topic. Thanks for sharing this detailed article. It’s great article. Thanks for sharing great post thank you !